Vladimir Gorbik (b. 1970) began his musical studies in Yekaterinburg, Russia, and continued them at the Moscow State Conservatory, completing a specialization in choral conducting in 1998 and in orchestral conducting in 2000. 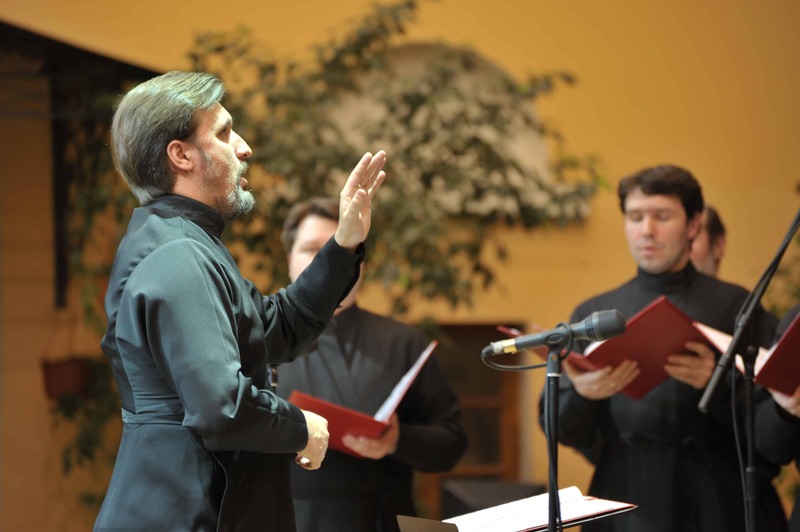 Since 1996 he has served as the choir director at the Moscow Respresentation Church (Metochion) of the Holy Trinity-St. Sergius Monastery, and since 1998 has been the Artistic Director and Conductor of the professional men’s chorus formed at the Metochion. With this choir he has made more than a dozen outstanding recordings, of both liturgical services and concert programs. The choir has on numerous occasions sung at Patriarchal services in the Dormition Cathedral in the Kremlin, and they accompanied Patriarch Alexy II on his trip to the Holy Land in 2000. The repertoire of the Metochion’s Men’s Chorus cultivates the finest repertoire and interpretive traditions of the Moscow School and the Holy Trinity-St. Sergius Lavra. For his outstanding achievements and service, he has received an award of recognition (gramota) from the Patriarch, and the medal of the Order of St. Sergius of Radonezh, 2nd Degree. In September 2012, he was appointed to the conducting faculty of the Moscow State Conservatory. Since then he was awarded awarded a “Blessed Letter of Commendation” by Merkuriy, Metropolitan of Rostov and Novocherkassk , chairman of the Synodal Department for Religious Education and Catechesis of the Russian Orthodox Church, for the January 29, 2014 participation of the Men’s Choir of the Moscow Representation of Holy Trinity-St. Sergius Monastery (Lavra) in the Kremlin Concert Hall and the Concert Hall of the Cathedral of Christ the Savior in the context of the XXII International Christmas Educational Readings.